I received a beautiful book for a significant birthday back in September. Rôtis: Roasts for everyday of the week by Stéphane Reynaud. The photography by Frédéric Lucano is sumptuous and mouth watering. Monday is roast beef; Tuesday is roast veal; Wednesday is roast chicken and game; Thursday is roast pork; Friday is,as you might expect, roast fish; Saturday is roast lamb; and Sunday lunch is roast game. As well he adds extras in the back of the book – beautiful vegetable accompaniments to these delectable roast meals. 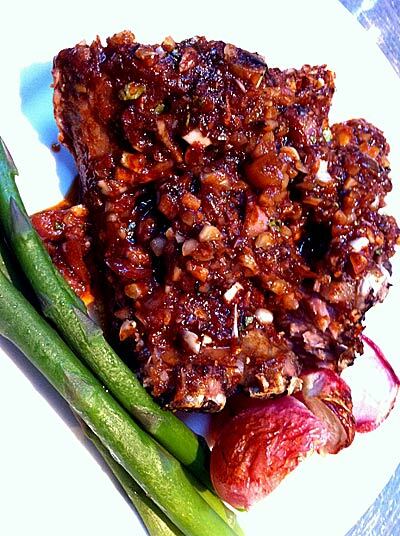 We are fans of pork ribs and this recipe caught my eye. 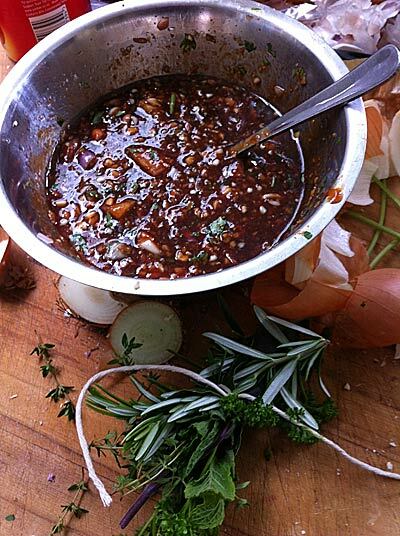 Combine the garlic, shallot, peanut and coriander with the tomato sauce, soy sauce and olive oil and mix well into a marinade. A word of warning. Be careful with the soy sauce quantities and the type of soy sauce you use. If you are using a very dark rich soy sauce then I would halve the quantity. If you are using a light aromatic soy then 150 ml will be OK. Soy can tend to completely dominate the taste so be cautious. Put the onion, leek and celery into a large pot of water and allow to simmer over a low heat. 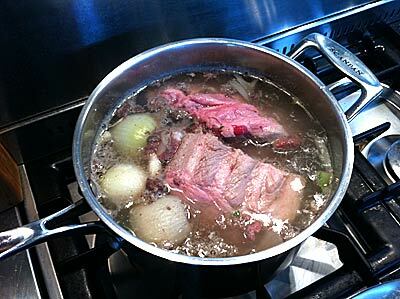 Add the bouquet garni, then immerse the ribs and simmer for 30 minutes skimming the top of the pot regularly. When you take the ribs out they should have a glazed appearance and the meat should fall away from the bone. Make the changes I recommend and this is a beautiful dish. I highly recommend the cook book as an addition to any meat lovers bookshelf.